Fortunately, Hooper seems to be aware of his limitations, and whilst the operatic quality of Les Miserables represents a great departure for him, he doesn't try any awkward, fumbling attempts at mounting a traditional movie musical. Rather than staging elaborate numbers, most of the songs in the film are depicted in close-ups, allowing for a keener focus on the physical performances of the actors, stripping away much of the ostentation of musicals whilst retaining the heightened emotions. It's an occasionally disorientating approach to the material that plays against expectations whilst also playing to the strengths of the actors, who tend to place a stronger emphasis on acting over singing when the camera is so close that it makes physical movement less of a necessity. Nowhere is this more effectively done than during Anne Hathaway's performance of "I Dreamed A Dream". First off, it's a beautiful and emotionally devastating song even outside of the context of the story: as delivered by Fantine, the poor woman who finds herself falling into a cycle of abuse and degradation to provide for her daughter, Cosette (played by Amanda Seyfried), it's a song which is rife with boundless sorrow and yearning for a better yesterday when today and tomorrow look so utterly bleak. As strong as the song itself is, it's given an extra charge by the look of pain and fear on Anne Hathaway's tear-stained face. It's a much rawer performance than you might expect in a lavish musical, and such an intense, uncomfortable focus amplifies the power of the original song. It helps that Hathaway's vocals are more than up to the task, and the resulting scene is nothing short of majestic. Whilst Hathaway gets the defining moment of the film, much of the heavy lifting is carried out by Hugh Jackman and Russell Crowe, as the noble thief Jean Valjean and the malevolent policeman Javert, respectively. Though the relationships between Valjean, Fantine and Cosette are important parts of the story, it is the cat-and-mouse game that the two men play over more than a decade that defines both participants, as well as the film itself. 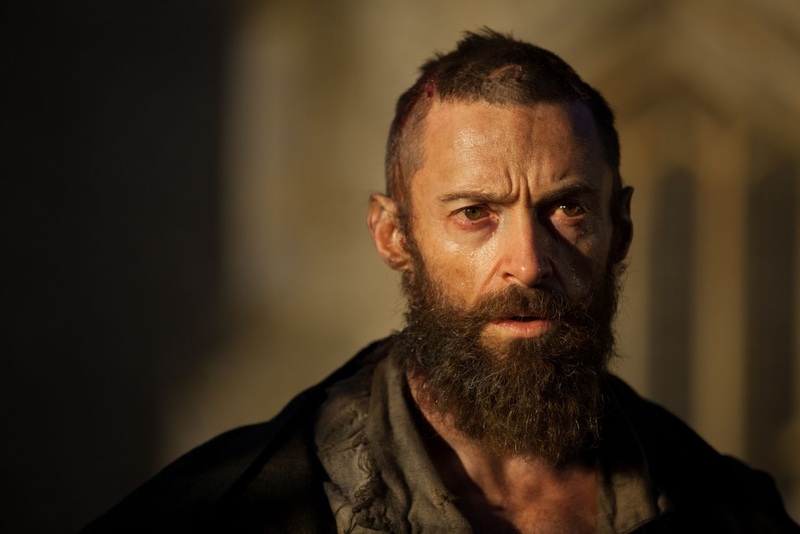 From the moment both men are introduced in a prison in 1815 (Javert as a guard, Valjean as Prisoner 24601), their destinies become inexorably entwined, and as Valjean breaks his parole and tries to reinvent himself as an honest businessman, Javert is always a step or two behind him. As such, many of the scenes in the film consist of the two men singing in tandem, and whilst Jackman has prior form as a Broadway star, Crowe is no Pierce Brosnan when it comes to singing on screen, something which will probably come as a surprise to those unfamiliar with his work as the lead singer of Fifty Odd Foot of Grunts (though not as much of a surprise as it comes to anyone familiar with it). Crowe's voice works in conjunction with Jackman's, if only because they seem to both be doing impressions of David Bowie at different points in his career (Jackman, Labyrinth-era; Crowe, Heathen-era), and his solos are powerful in their own right. Like Hathaway, Crowe's performance leans more heavily towards acting rather than singing, but he's good enough at the former to overcome his deficiencies when it comes to the latter. There's an authenticity to Crowe's performance that might seem at odds with the theatricality of musical numbers, but it's a contrast that is compelling, rather than distracting. It helps that Crowe's performance feels natural to the world of the film, which is both earthy and stylised. The set designs are often quite expressive - particularly those on display during Fantine's descent into the murky underworld of Paris - whilst also being authentically dirty. It's a combination that recalls David Lean's adaptations of Great Expectation and Oliver Twist: undeniably beautiful to look at, yet also believably disgusting. The Paris of Les Miserables looks like a genuinely awful place, with even the nicer parts apparently covered by a thick layer of grime, whilst the final act of the film, in which revolutionaries man the barricades, is suitably bloody. The intermingling of mud and melody throughout makes Les Miserables an intimate epic, a film that deals in big, bold emotions and concepts, but which remains strictly convicted to presenting a worm's eye view of life on the lowest rungs of French society. If there is a major problem with the film, it's one of compression. It moves at such a breathless, relentless pace, moving from song to song and event to event with barely a pause for breath, that some of the key moments don't have time to settle in. Considering that it's a truncated version of a musical, which was itself an abridgement of one of the longest books ever written, it's hardly surprising that the story feels a little rushed as it tries to cram everything in, and the gleeful, uninhibited speed of the film is utterly charming. Still, there are a few key emotional moments that fail to hit as hard as they could because they pass by so quickly. One of the key reasons "I Dreamed A Dream" is so effective is because the film is forced to slow down and take its time. Still, Les Miserables is such an entertaining experience that this a minor quibble. It's a big, brassy musical that flies its colours proudly, and which revels in its sheer exuberance. Yet it also remains grounded, relying on the faces of its cast and unrelenting gaze of its too-close camera to underpin the expansive majesty of its music. There's a delicate balance between the musical source material and the distinctly anti-musical aspects of the presentation, but Tom Hooper and his crew do a superb job of maintaining it, in the process doing something genuinely new with something that is so familiar. It breathes new life into an old standard.